I found this Stanley No. 45 Combination plane in an antique store in Chico, Ca. Can anyone give me an idea of what this antique tool is worth; we'd be interested in findin out. I was passed down one of these with it's oringinal cutters, and was wondering around how much they may go for. Please feel free to contact me @ deanna_givens@yahoo.com. I have one plane like that with cutters and i want to sell it. Your plane looks to be in great condition. 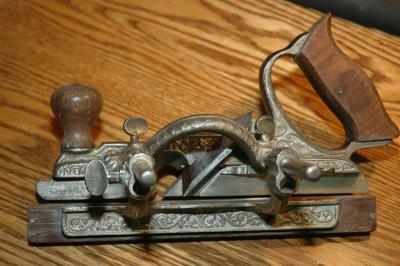 I sold a Stanley moulding plane that looked very much like your no. 45. My plane had a peice broken on it which rendered is useless. I let a box of various shaped moulding plane irons go with it. I wish I had kept it now. I think you have a real prize there!